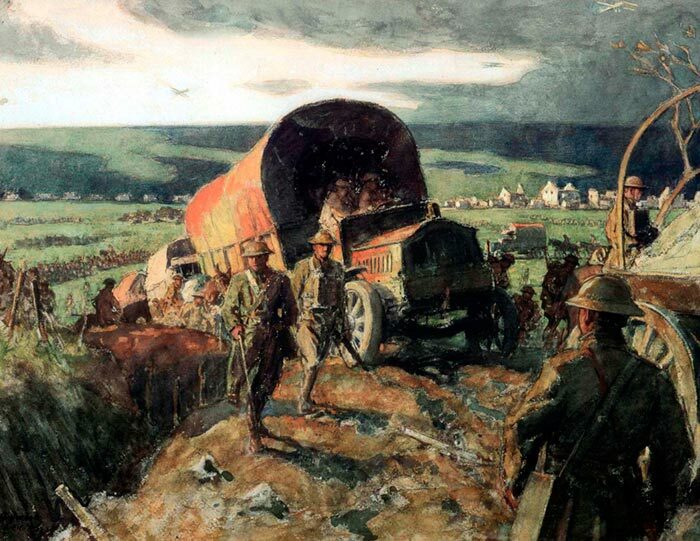 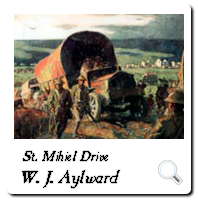 "On The Trail Of The Hun, ST. Mihiel Drive"
In this painting Aylward provides a glimpse of the seemingly endless truck and wagon trains that followed the advancing armies to keep them supplied with the materiel of modern warfare. 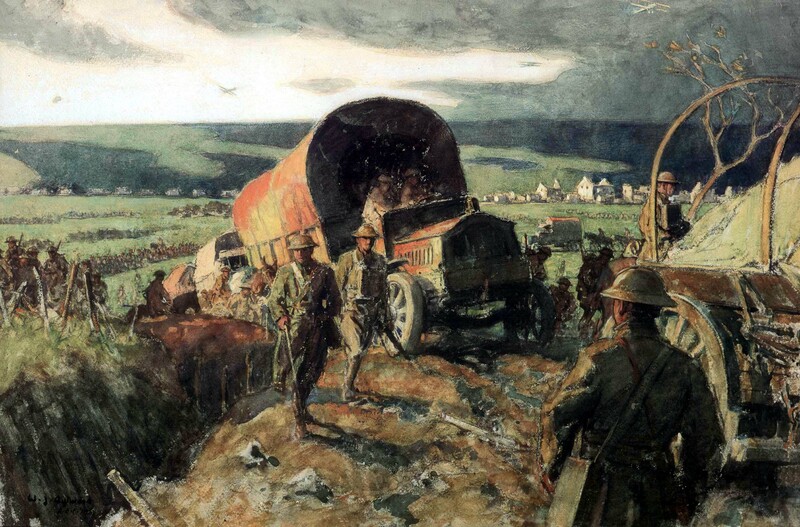 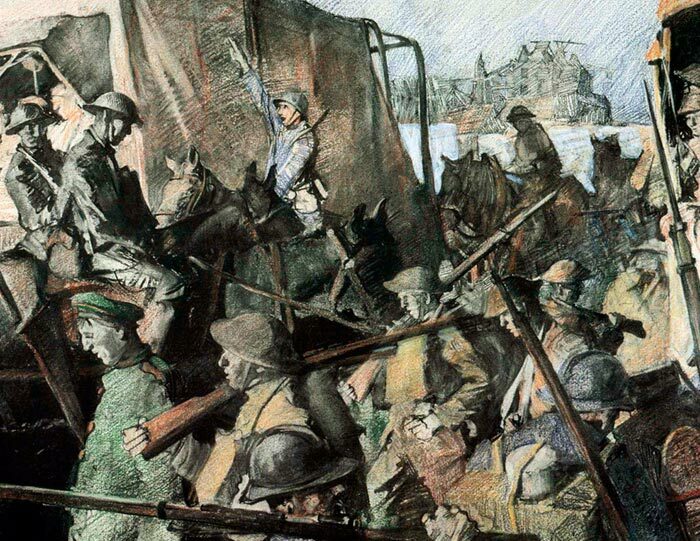 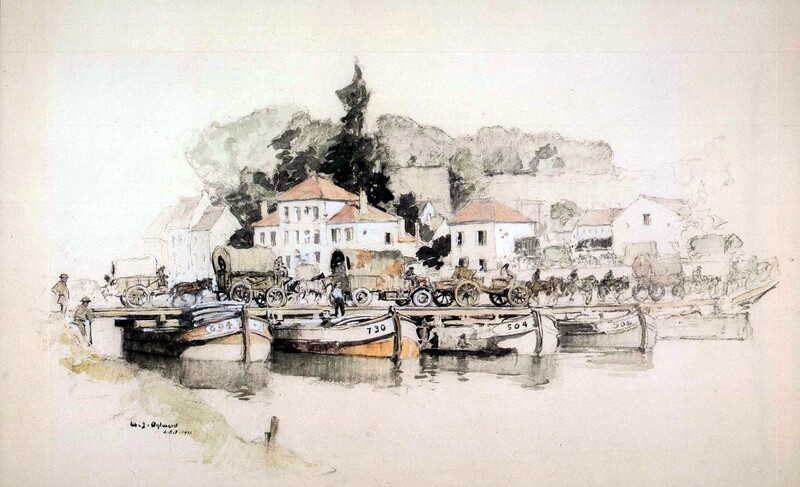 The fledgling truck making its way across the bridge in the midst of a convoy of horses, wagons, and artillery captures the introduction of the internal combustion engine to war. 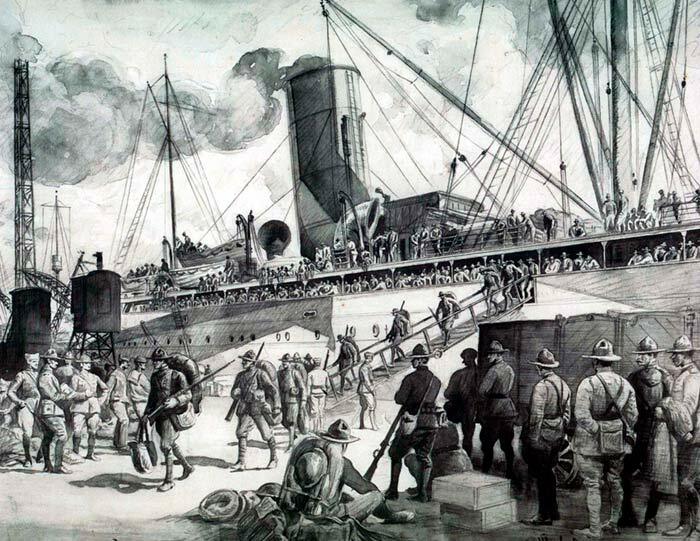 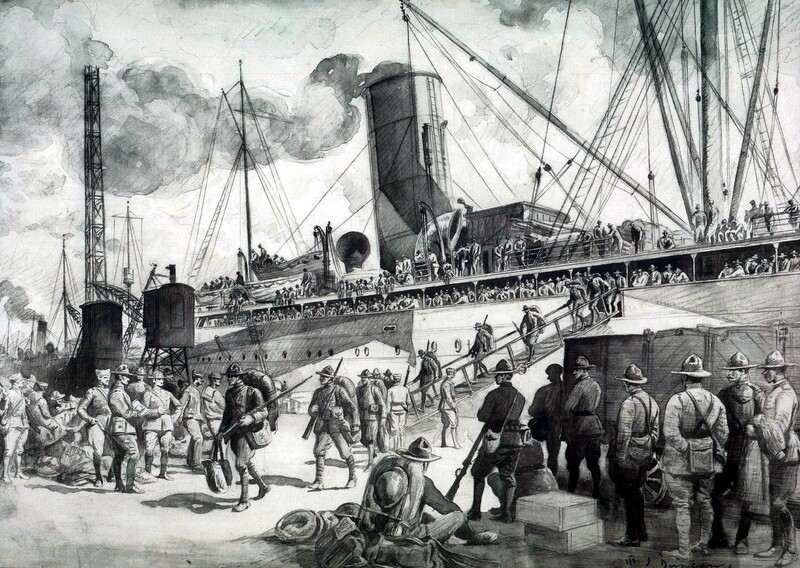 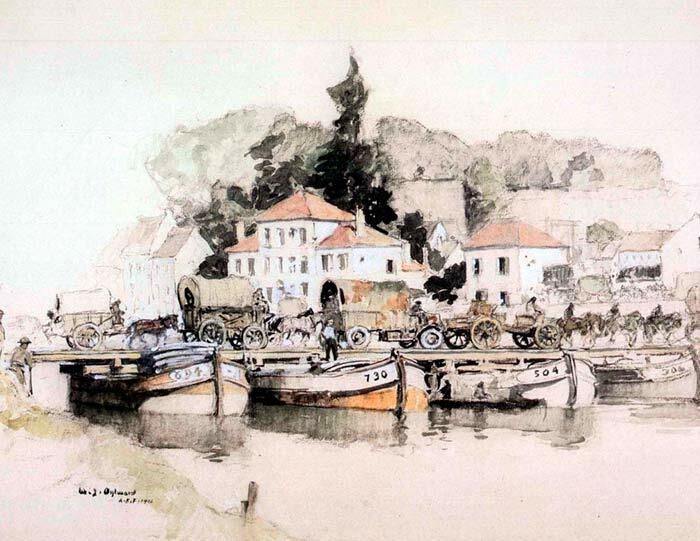 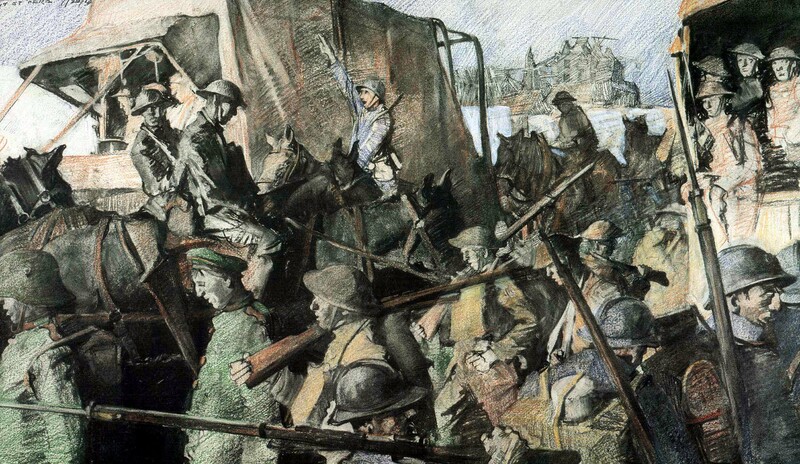 Duncan's skill as a detailed illustrator is evident in this depiction of the arrival of one of the many ships that transported the 2 million "doughboys" who eventually reached Europe. 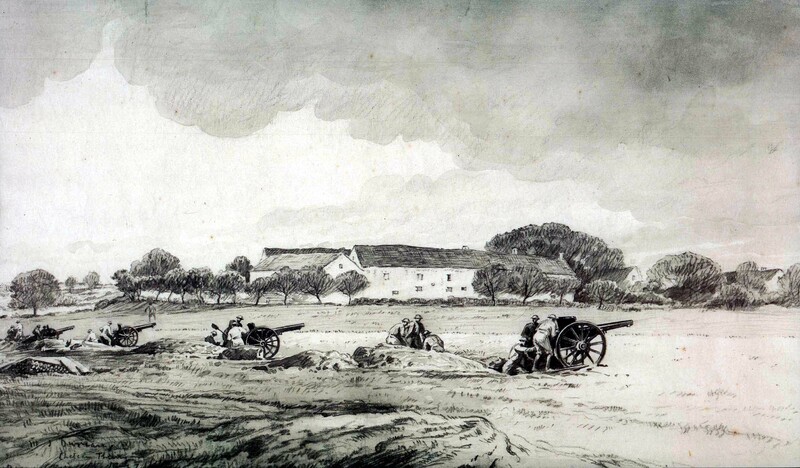 This scene of an American field artillery battery armed with the famous French 75-mm. 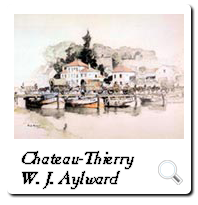 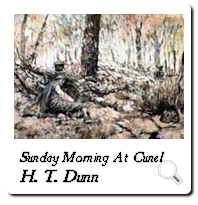 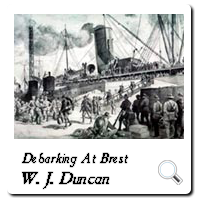 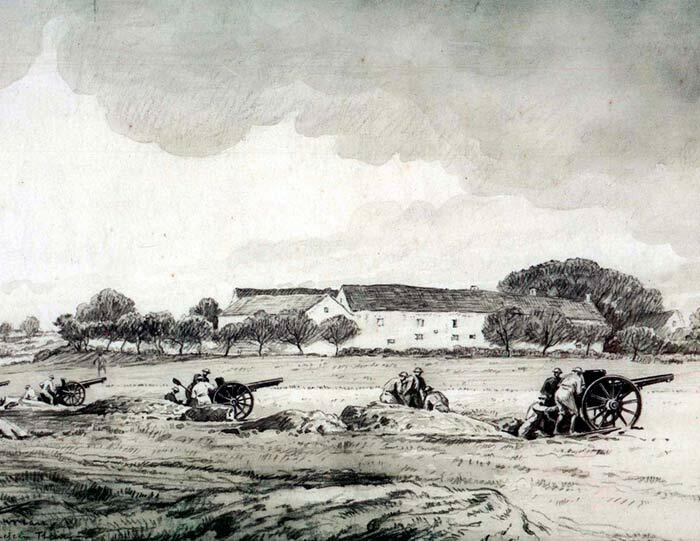 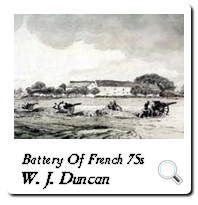 guns provided Duncan the opportunity to include some details of the French countryside. 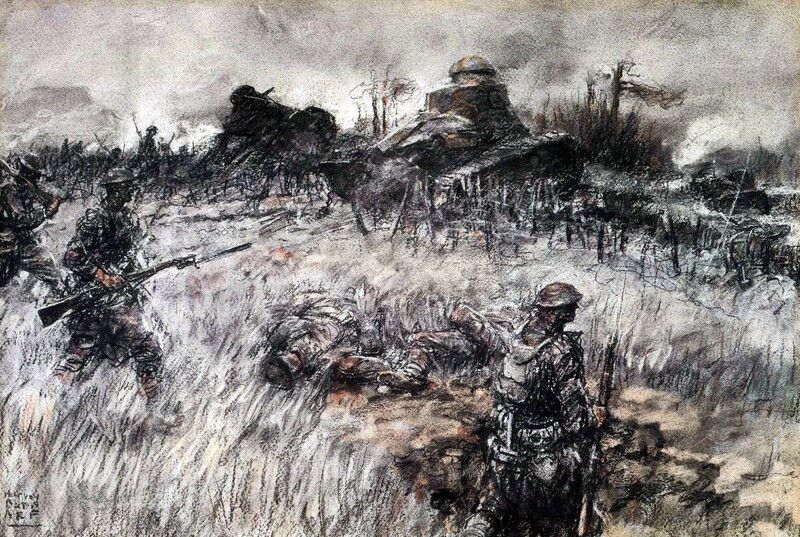 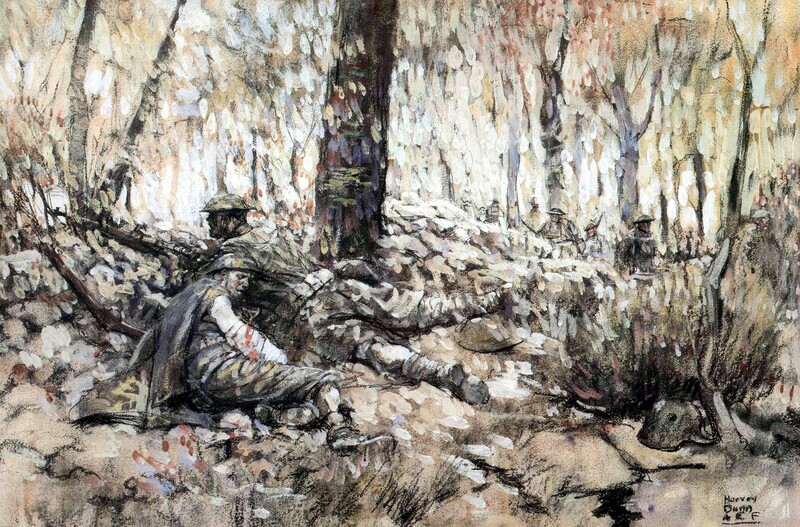 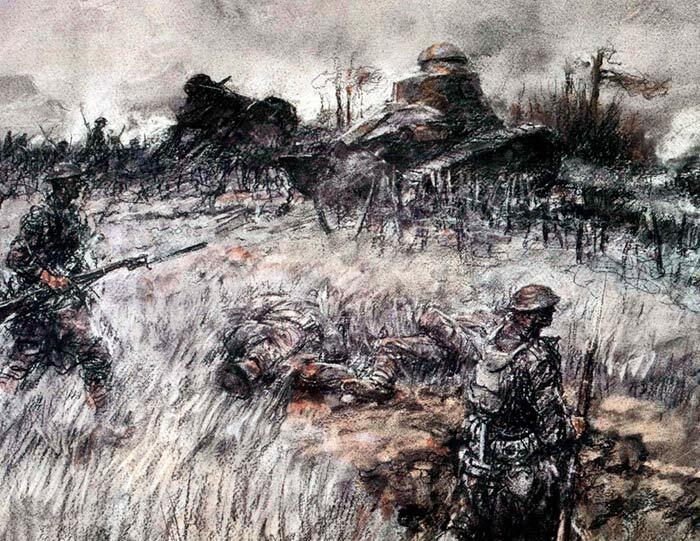 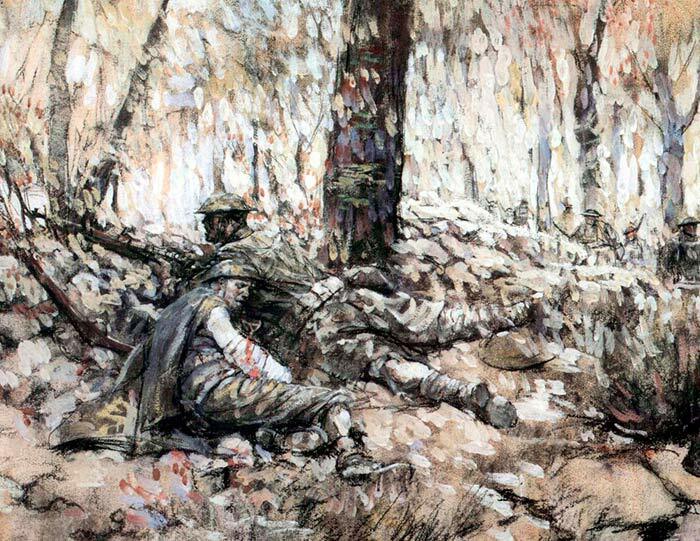 This impressionistic view of the aftermath of battle shows American infantrymen who have just overrun an enemy position, as evidenced by the abandoned German helmet in the foreground. 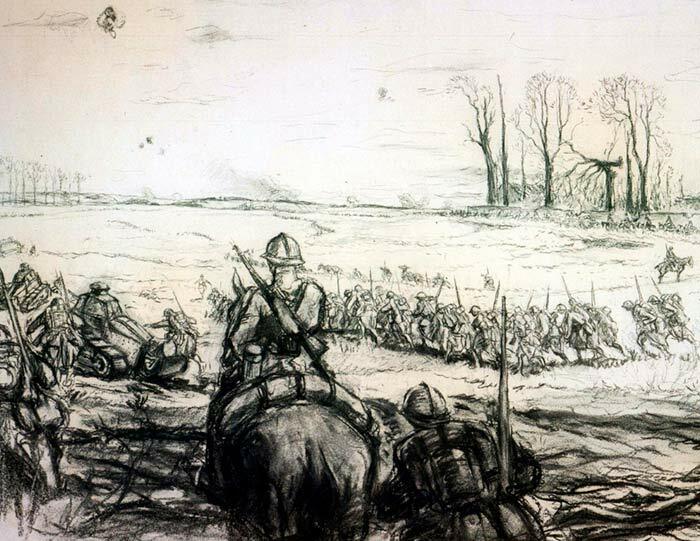 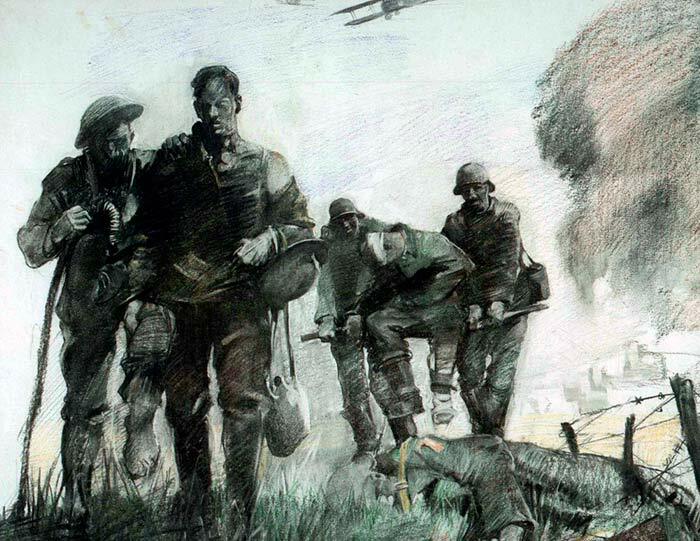 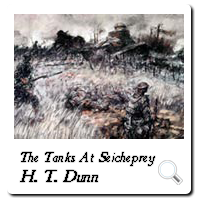 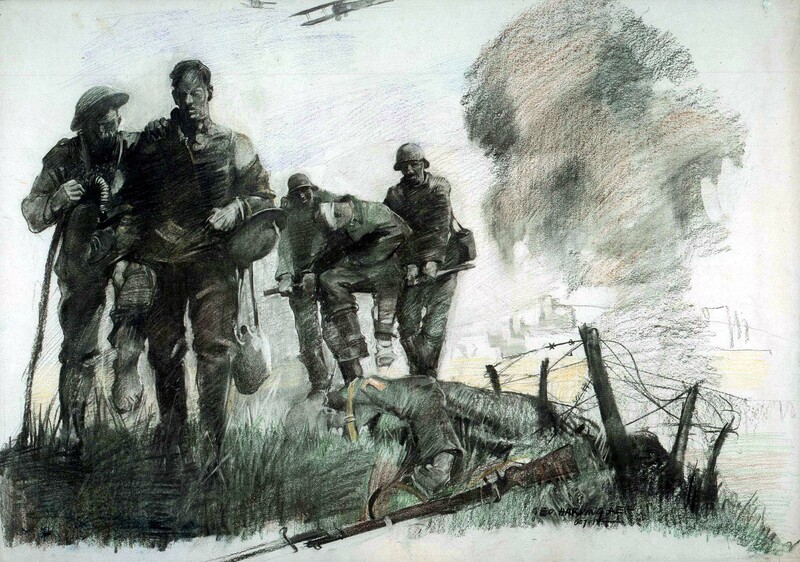 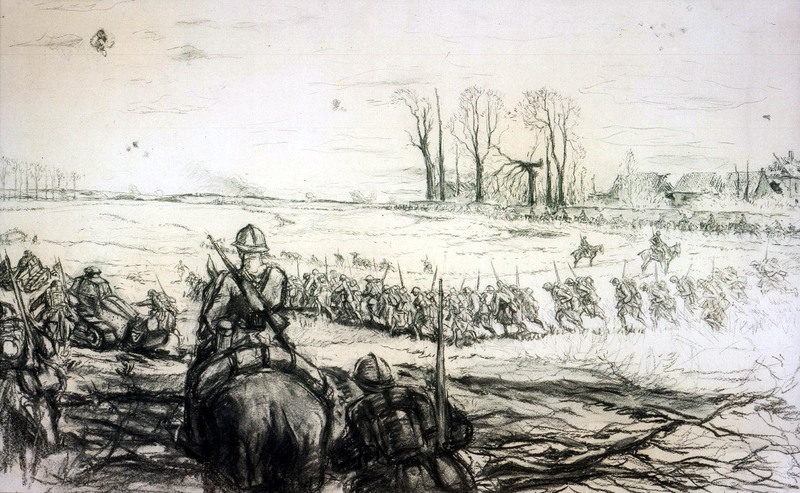 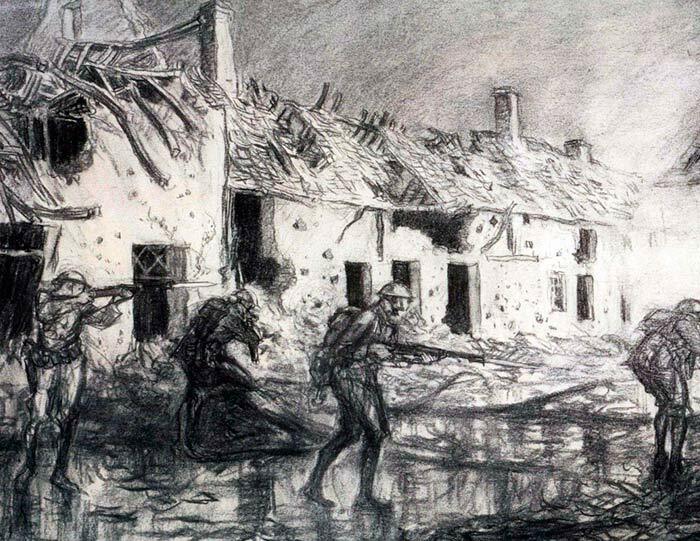 In all probability Dunn made the preliminary sketches for this piece using his unique artist's box as he accompanied the tanks and infantry into the barbed wire-infested no-man's-land. 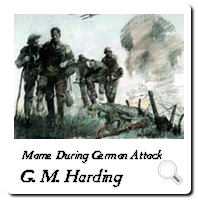 Here Harding shows the ever-present human toll of war along with two of the innovations of the Great War, the airplane and barbed wire. 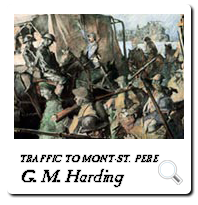 This jammed road provides a vivid reminder of the chaos and confusion that surrounds modern war even in rear areas. 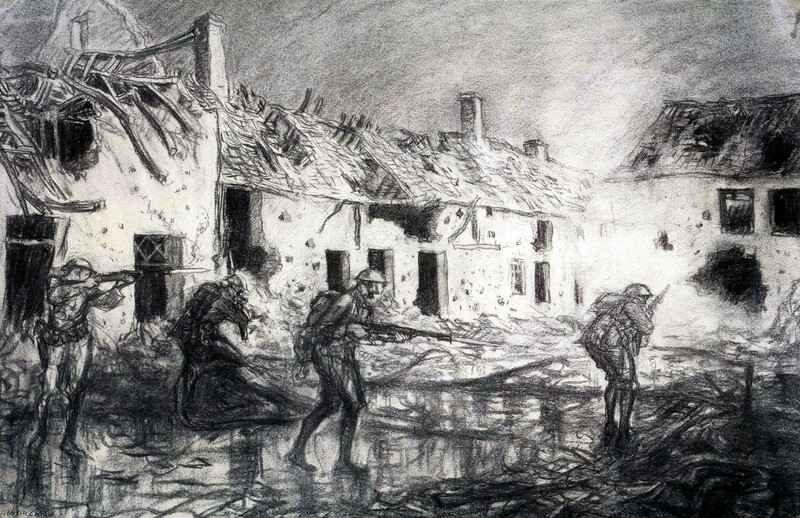 American infantry are shown here finishing the job of rooting out the enemy after artillery has virtually destroyed the town. 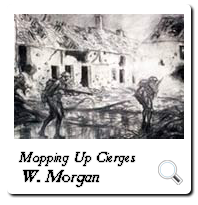 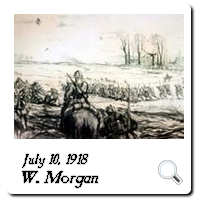 On Field, July 10, 1918"
Morgan captures a turning point in the history of warfare as both tanks, the weapon of the future, and horse, which would never again play any significant role, move intermingled with columns of infantry, the ever-present mainstay of war.